Use data to hone in on specific problems with your processes or services and solve them. This guide will help you leverage existing data to map out your small business start-up process and find the gaps where it should be improved. Data can help us run our cities better and build more useful services. To stay focused, it’s important to choose a specific problem and find the data points to guide your effort toward solving it. First, start small and choose one process to improve. For example, if you want to make it easier for entrepreneurs to start a business, you could focus on the amount of time it takes for a potential business owner to navigate your requirements and get the necessary permits. This practical guide will help you find the right data that shows how difficult it is for entrepreneurs to start a business in your city. The guide also includes improvements you can make to simplify your business permitting process and improve the metrics you’ll uncover in your own data. 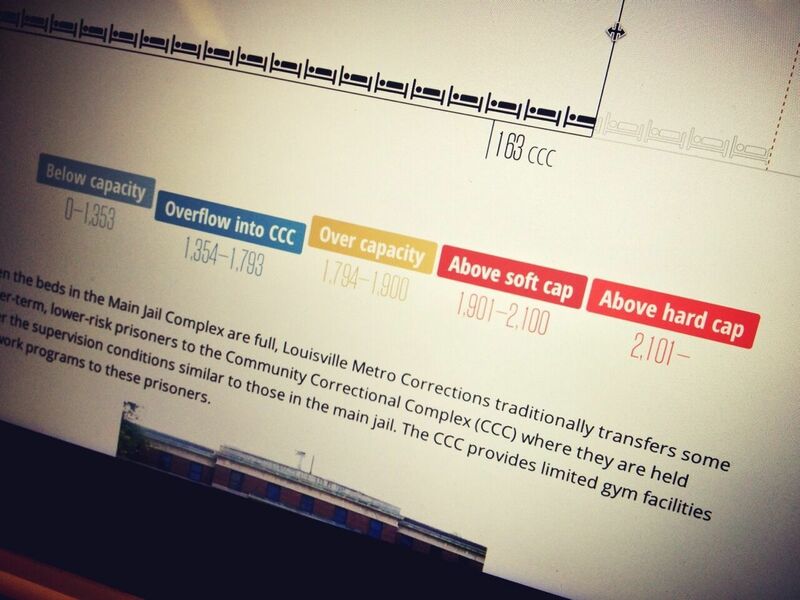 An example in criminal justice: In Louisville, KY, judges use a dashboard showing live jail population data to make informed decisions about sentencing. A dataset is a collection of data held in one or more of these formats that needs to be interpreted by someone with expertise in the department’s business process to be useful. On its own, without context, it’s difficult to make decisions or even understand a dataset. Raw data is just a collection of information without a description or purpose. Data becomes valuable when it’s interpreted. Metrics are created when someone with experience in how the data is collected and what it represents decides what key numbers, columns, or individual data points are the most important and can be used as indicators of success. If you work with data, or interact with people who do, you have inevitably heard the word 'dataset.' It’s one of those jargon-y words that gets thrown around, and people are somehow supposed to know what it means. It’s like when you go to the doctor, and he tells you that you will need 'labrum repair,' and you feel stupid asking what a labrum is. For example, a department might maintain a simple database with millions of records describing permits issued to business owners. Each record in that database could contain information like what permit was issued, the business it was issued to, an address for that business, and the date the permit was issued on. The department that owns this data wants to know how many permits were issued by neighborhood last year in order to see where economic activity is picking up. An expert could interpret that data, extract the relevant information from each record, and make a map that shows which neighborhoods had the most permits issued. This interpretation of the raw data can be turned into a metric, a number that describes economic activity in specific places. This example illustrates the best way to use data to make decisions. Start by coming up with a question, then find the raw data that might answer it. Interpret that data, and create metrics that specifically describe the thing the city’s interested in understanding. Before exploring raw data, have an actionable question in mind. The question should help address a policy or process concern within the city. For example, a council member may want to show an increase in first-time entrepreneurs successfully completing their business license. The question you could ask is: how many first-time entrepreneurs successfully completed their business license in 2011? How many permit application packages are complete at the first submission? How long does it take to apply for a business license or permit? How many women or minority owned businesses are there within the city? What percentage of businesses are in Business Improvement Districts (BIDs)? Do people visit the business license page on the city website? Are they finding what they need? How many visitors download the business license application or form online? It’s important to understand what outcomes matter to the city’s decision makers. A prioritization exercise may align stakeholders and determine where city staff spends time exploring raw data. It’s easy to explore forever and this exercise will narrow the team’s focus. To begin this exercise, schedule an hour meeting with technical staff and key decision makers like the Director of Economic Development and City Manager. 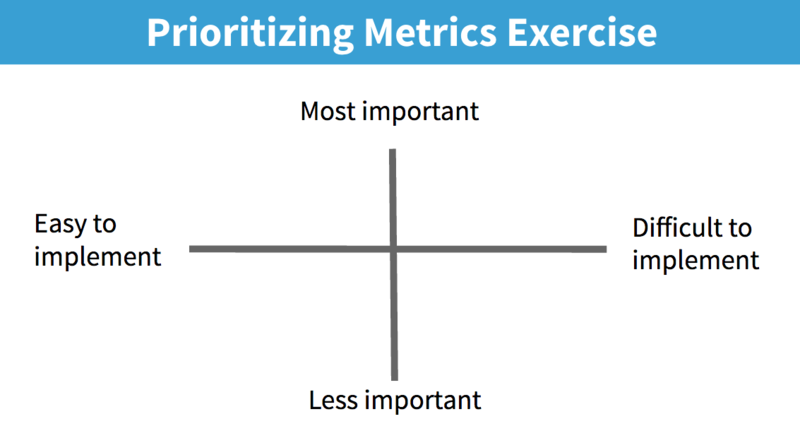 A framework to prioritize your metrics. Draw the above image on a white board and bring sticky notes. On each note, write one metric that the city’s looking to track. Have decision makers place the Post-it notes note where they think it belongs along the Y axis (i.e. most to least importance). Technical staff can adjust the sticky notes with specific metrics along the X axis (i.e. ease of implementation). It’s encouraged that tech staff and decision makers have discussions as they move Post-it notes along the axes and come to consensus about the metrics they are prioritizing. Begin to track subtle gaps in available data. For example, an elected official may be interested in seeing how many first-time entrepreneurs were women or persons of color. The city may not be collecting that demographic information, so this could be an indicator to start. Don’t forget to work with other departments or community partners like the Small Business Development Center (SBDC) or Chamber of Commerce to access raw data. Explain how you intend to use this information and offer to share results or collaborate throughout the process. The simplest tool available to help analyze raw data is Excel. Don’t underestimate its usefulness: Excel can help with basic comparisons or correlations, and allow you to do more in-depth research when you’re ready. Other tools on the market include Chart.io or Tableau, paid products that can offer more features out of the box. Remember data analysis is about the process, not about using the latest technology available. Developers on staff will also have ideas on how to approach exporting data and involve them early in the process. For example, Python developers may use ‘R’ or ‘pandas’ to explore the data, while Ruby developers may use Rails, Postgres, or Chartkick.js. When exporting data, remove unique identifiers like names, addresses, or telephone numbers before beginning analysis. Every dataset will be different. Be careful about relating pieces of information back to individuals. Accurate metrics are essential for measuring a city’s impact and analyzing raw data is a helpful first step. Each metric should drive a process improvement. Avoid spending too much time exploring a dataset if there’s not an actionable step the city can take. For example, review the total number of businesses opened in 2010 and compare that to results from 2011. The data may show that there was a 27% increase in permits issued and it it took three more weeks to process the permits submitted in paper form. The Office of Economic Development may use this data to prove why the city should transition to digital forms and decrease the time it takes to process permits overall. Once the metric is identified, city staff can track progress and execute targets to improve performance. Metrics provide decision makers with the information they need to track and drive progress toward the goal of helping first-time entrepreneurs navigate the complex government process. For example, if a city wants to increase the number of first-time entrepreneurs successfully completing their business license application by 25%, establish an action plan. Staff can test different approaches like promoting resources from the Small Business Development Center, starting office hours with permitting staff, or reorganizing content on the website to provide clarity on the process. Identifying the right activity to measure and then using a metric to monitor that activity is just one step. Staff should meet regularly to discuss how to use data-driven insights to inform these actions and establish a process for sharing results. Metrics can be tracked on a weekly or monthly basis and shared quarterly with key stakeholders like the mayor’s office or city council. Ultimately you’ll show how these data-driven decisions are simplifying the business startup process and improving the city’s economic activity. Code for America Labs, Inc. is a non-partisan, non-political 501(c)(3) charitable organization. EIN number 27-1067272.